Founders Title Company is a wholly owned subsidiary of Dwyer, Cambre & Suffern and provides title insurance both for its residential and commercial closings. The depth of experience of the Founders Title Company attorneys provide for smooth and efficient closing transactions of the highest quality for lenders, property owners and developer clients. Founders Title Company writes title insurance for Fidelity National Title Insurance Company and for First American Title Insurance Company, two of the largest national title underwriters. Founders Title Company provides services for its lender, owner and developer clients throughout the state of Louisiana. 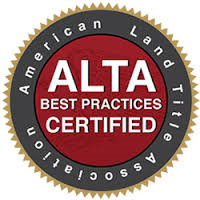 Founders Title Company complies with ALTA Title Insurance and Settlement Company Best Practices in all material respects and has been issued an ALTA Best Practices Certification pursuant to the ALTA Best Practices framework. Please contact attorney Elizabeth Hammant for a quote or any information that you might require.